In the last two installments of our Green Guide to Prefab series on Inhabitat we highlighted the history of prefab design and the evolution of mobile homes into modular prefabricated homes. Within the last ten years, consumers have come to expect a new level of design quality in prefab homes, and this new generation is looking to not only personalize their home, but to create a sustainable, modern space that is able to support eco-conscious lifestyle without any sacrifices. Prefab home builders have taken notice and are responding to the new demand by providing more options to prospective prefab homeowners. But if you’re looking to buy prefab, you may wonder which type of manufactured home is right for you? Inhabitat’s Green Guide To Prefab is here to help. Our latest article will focus on every project’s most important consideration — the building site. If your home isn’t in perfect harmony with its site – considering and responding to the location’s natural environmental characteristics – you’re not getting the best green home you can get. 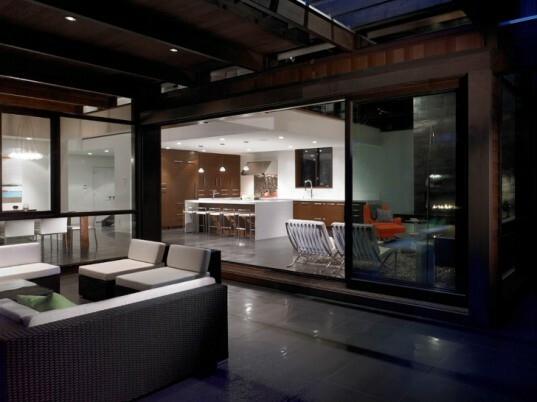 So what must a prefab home do in order to get the most from its site? Jump ahead for the answer as former Lindal Cedar Homes CEO and green design consultant Michael Harris returns to Inhabitat give us some insight. Strategically siting your home to respond to the sun’s daily path is one of the most important things one can do to acheive energy efficiency in any building – especially a home. By taking design measures to bring the sun’s energy into your home during the cold winter season and keep out excessive solar energy during hot and humid summer days, you can dramatically increase the overall comfort of your home and save considerably on your monthly energy bill. 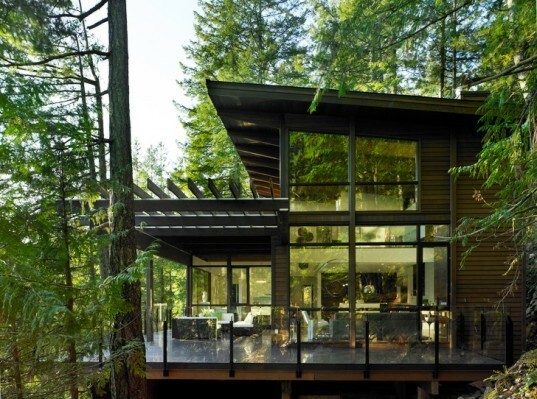 Location of windows and use of solar shading devices like trees, overhangs and blinds can have a huge impact on how hot your home gets throughout changing seasons. A carefully sited home that is designed with consideration for the movement of the sun year-round will also give way to better natural interior daylighting and reduce the need for artificial lighting. Copious natural light enhances the feeling of “home”, and as studies have shown, the health benefits of natural light can be dramatic for occupant’s wellbeing, so be certain to give solar design the time and attention it deserves! 1. On your site, note where the sun rises in the morning and sets at the end of the day. Ask yourself: How can my prefab be customized or oriented to best optimize the sunlight it receives? What can be done with windows and shading devices to improve the comfort in season extremes – the very hottest days of summer and the coldest days of winter. 2. Can adjustable roof overhangs be included in the design to account for different seasonal sun conditions (more shade or more light)? 3. Based on my lifestyle, where do I want the sun in the early morning? In my bedroom? In the kitchen? What about midday and during the late afternoon? 4. How can my home take advantage of the trees on-site to increase comfort in the summer (through shading windows) preserve the landscape, and save money? When it comes your home, harnessing the power of the wind does not mean you need to install turbines. Instead, there are far simpler ways that the design of your home can benefit from nature’s breath. 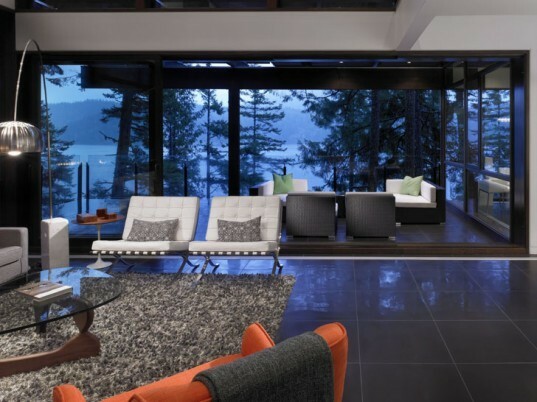 Orienting your home to take advantage of summer breezes for cooling and ventilation are another way to reduce energy costs, and more importantly, create a comfortable, naturally cooled living environment. The same can be said for dealing with harsh winter weather. If you live in an environment where winter winds can be less than forgiving, proper orientation can help shield you from their wrath. Warming Breezes: When the summer months roll around, the cheapest and most eco-friendly way to cool your home is with wind. It is important to position operable windows low on walls to let the cooling breezes in, and high on the opposite wall to let the hot air out. Having an operable skylight, chimney, or other high opening in your home that you can open at will do wonders in terms of sucking hot air our of your house (it’s called the “Stack Effect” and it’s a pretty nifty when it comes to natural ventilation). With thoughtfully-considered natural ventilation you can even forego air-conditioners, in a mild dry climate. Winter Winds: The same winds that help cool our home in the summer can be far less beneficial in the winter season. Keeping that in mind, you can position a garage (or a wing of the house) to shield your home from icy winds and drifting snow,so it’s useful to study your site and learn about the typical seasonal wind pattern on the location. Variations in topography can be deceptive, and a site may look flat when it is not. It is important to obtain a topographic study — or at least to shoot several grades — where you are considering building to ensure you are getting to most from your site. The construction of your home should follow the contours of your site. Finding a site that is sloped or on a hill is ideal. The changing level of ground allows for your building to occupy space efficiently, and the sloping ground will make it easy to incorporate lower levels that wouldn’t be available when building on a flat surface. Moreover, not only will building on a sloped site look more natural and save you money on construction, but bermed living spaces just a few feet below the ground’s surface benefit from cool soil temperatures that are as low as 55 degree year round. By building into a slope you can reduce both your heating and cooling costs. 1. What are the site’s front, side, and rear setbacks? 2. Are there easements on the property? 3. Where will the septic system and well be located? 4. Are there wetlands, and if so how far away from them must the house be? Researching these factors will save you a lot of time, money and heartache in the future if you decide to expand your living space. Local building regulations establish certain requirements that are climate- or weather-based. These include snow loads, wind loads, wind-driven rain resistance, and fire-related and seismic regulations. These are just a sampling of what will affect a design — they are important and you will need to take the time to educate yourself on them. All this information can be found at your local building department and need to be addressed carefully. You should also note that different sites in the same town will often have different requirements, so don’t make any assumptions. Doing your homework will help you make informed decisions with confidence. Your new-found knowledge will also prove to be a useful tool when working with producers who will promise you the world and try to offer you more than you need. If you fully understand their building suggestions, you won’t end up paying for structural upgrades you don’t need. A well-sited and well-designed prefab is green by nature – it enjoys lower utility bills, disturbs the site less, costs less to develop, and quite simply, it just looks and feels better! The above mentioned site-related design drivers are just a small sample of the many that will help you shape your new home. Not every product can be modified to respond to them with ease — or modified without bending the building system to the point where it loses all efficiency. Your best bet is to look for producers with a proven track record and to then narrow your list to those who are able to meet your expectations and handle the unforeseen. Walking the site and really exploring these site-related factors is critical. A compass, a site plan, and a real working knowledge of siting are also critical. It takes training and experience to handle these properly, and very few projects could do without these considerations. If a prefab home producer is unable to meet the task, the outcome is likely to be less than extraordinary and not worth your life savings. 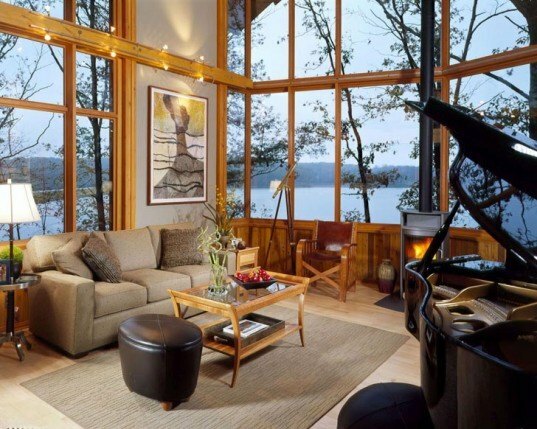 Lindal Cedar Homes, a company for which I served as CEO and now for whom I consult, is a producer that has made a reputation for themselves by building beautifully sited homes on some of the planet’s most spectacular natural environments. Lindal’s commitment to creating beautiful green designs has given way to over 50,000 completed projects worldwide. But why are Lindal’s homes so breathtaking? Lindal kits have been designed and engineered to be configured with almost infinite flexibility, making them truly site-responsive designs that will meet any climatic condition. With over 100 Lindal dealers located throughout North America and in over a dozen international markets, Lindal’s team of experienced professionals are there to help clients understand their site’s natural assets and how to celebrate them, setting the stage for what is to come. Building green requires a great deal more than selecting sustainable finishes and materials – it begins with respecting and responding to the very environment in which your home will reside. I believe that the combination of a flexible building system and the personalized local guidance of a trained professional are essential in creating a truly sustainable home. When you build a home, the end result should be harmonious, energy-efficient, naturally heated, naturally cooled, well ventilated, and a joyful living environment. Judicious amount of windows is equally important to placement/location of windows. Full height windows may be dramatic, but even double glazed window leak heat signficantly more than the rest of the envelope. 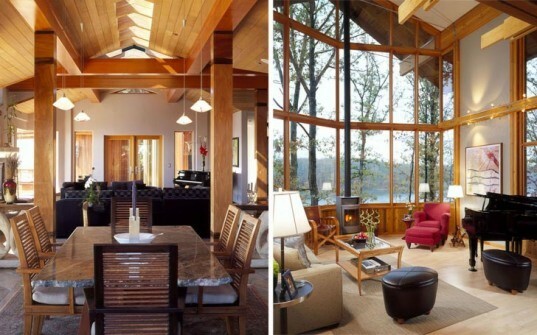 Unshaded east and west windows can make for significant summertime overheating. Thanks for bringing to light that siting is just as important if not more so than materials. great info! Whether you're building prefab or not, paying attention to the surrounding environment is extremely important! use what Mother Earth gave you! Thanks for this! great post. never underestimate the power of a well sited home. comfort is key to a good living space and life. In the last two installments of our Green Guide to Prefab series on Inhabitat we highlighted the history of prefab design and the evolution of mobile homes into modular prefabricated homes. Within the last ten years, consumers have come to expect a new level of design quality in prefab homes, and this new generation is looking to not only personalize their home, but to create a sustainable, modern space that is able to support eco-conscious lifestyle without any sacrifices. Prefab home builders have taken notice and are responding to the new demand by providing more options to prospective prefab homeowners. But if you’re looking to buy prefab, you may wonder which type of manufactured home is right for you? 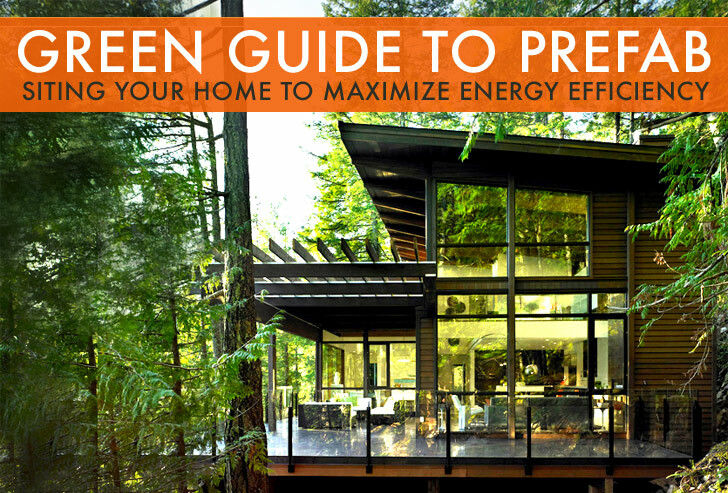 Inhabitat's Green Guide To Prefab is here to help. Our latest article will focus on every project’s most important consideration — the building site. If your home isn’t in perfect harmony with its site – considering and responding to the location's natural environmental characteristics – you’re not getting the best green home you can get. So what must a prefab home do in order to get the most from its site? Jump ahead for the answer as former Lindal Cedar Homes CEO and green design consultant Michael Harris returns to Inhabitat give us some insight.